Place chops in a resealable plastic bag. Add dressing and herbs; seal and refrigerate 8 to 24 hours. 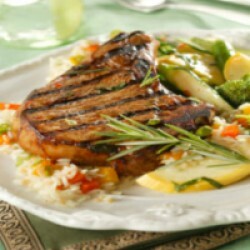 Remove chops from marinade; discard marinade. Grill chops over medium-high heat (or broil 4 inches from heat) for 8 to 10 minutes, turning once.